Acadia National Park Trail Map, by Map Adventures, 2008. 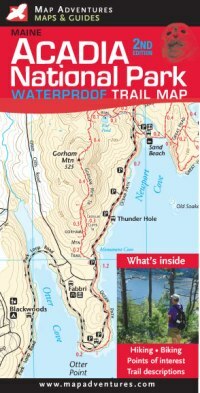 Waterproof version of attractive map of Acadia with Map Adventures' trademark easy-to-read style. East side of Mt. Desert Island on one side, west side on reverse. Scale of 1:22,500 with 20-ft. contours. Trail mileages between points shown on map. Also includes brief descriptions of suggested hikes. Waterproof, folded to 4 " x 9".